Give the Galaxy SII, Samsung’s latest Android flagship, to anyone to play with and they’ll come back with one of two responses – either “My, it’s thin!” or “My, the screen’s big!” These two design concepts are part and parcel to the SII smartphone’s appeal, but importantly it's backed up by some very solid performance. 4.27” is really a lot of screen real-estate, so much so that it makes the original Galaxy S’ 4” look rather ordinary. Just like its fore-runner, this Super AMOLED Plus capacitive touch-screen is also made of Gorilla Glass, with Samsung unfortunately deciding not to up the pixel count – it remains 480 x 800, a standard kept by many of today’s mid-to high range smartphones. This massive screen will find love from users who do a lot of web surfing, offering one of the best browsing experiences this side of switching over to a tablet, while also remaining king for capturing and playback of photos and video. 4.3” is big but not unique to the smartphone market, with HTC crossing the barrier a few years back with the HD2, while its new Sensation also rocks 4.3”, but with a better resolution of 540 x 960 pixels. At 8.5 mm the SII is also one of the thinnest devices currently on market, although marginally so. Sony Ericsson’s excellent Xperia arc runs it close with 8.7 mm, and while the iPhone 4’s 9.3 mm is not far off, when lining up the two devices next to each other the differences are minute. But while the iPhone 4 feels like a solid device, we were under the impression that if one does not handle the SII with care it might just snap in two. A touch of more metal, especially on the back cover, could have done a lot to not only spruce up the design but also toughen it up a bit. Fact is though, even if you carry a lot of junk in your trunk, the SII might still be able to slip in the back of your favourite pair of jeans. 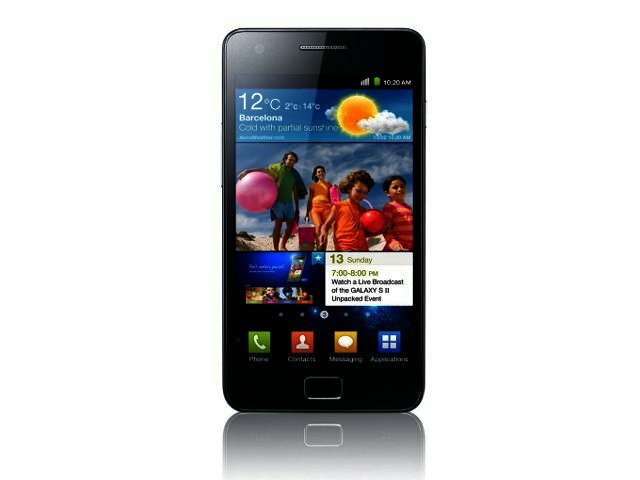 The Galaxy SII’s looks are backed up by very solid performance emanating from the dual-core 1.2 GHz ARM Cortex-A9 processor, helped along with a full scoop of 1 GB of RAM. This allows video-playback that is smooth, while also making scrolling through images a breeze. A side to side comparison with the original Galaxy S, running through the same set of photos, proved the SII superior, swiping through photos without hitting a glitch. Running the Smartbench 2011 benchmark application the SII scored a very good 3990 on the Productivity Index and 2210 on the Gaming Index. In comparison the Galaxy S scored 797 and 1852 respectively, while LG’s 1 GHz Optimus Black notched up 788 and 1771. Samsung provides 16 GB of onboard storage while also including a microSD slot to expand on this (unlike the iPhone 4 and Google Nexus S). Although the SII ticks all the boxes to what a modern smartphone should provide, including Bluetooth 3.0, Wi-Fi 802.11n, GPS and DLNA, it does not include a mini HDMI out to view your pictures or videos on HD televisions as the arc or Nokia N8. Speaking of which, the SII does not let the side down on the multimedia front, taking decent quality eight megapixel pictures and even upping the ante on the HD video front thanks to full HD 1080p video recording instead of the more common 720p. Viewing images and video on the 4.27” screen is very satisfying, while sharing images are also made easier thanks to the “send via” option replacing the “slideshow” link when viewing images. Zooming in and out of both pictures and webpages are also made easier with Samsung not just employing the regular, but somewhat haphazard, pinch-to-zoom, but now also a tilt-to-zoom feature. It’s fairly simple - put your thumbs on the screen and simply tilt the screen backwards or forwards. While not a game-changer, it’s definitely a nice to have. Running Android Gingerbread 2.3.2 the SII is definitely one of the more up-to-date Android devices in SA (the Nexus S is one step better with 2.3.4), offering a better typing experience (yes Swipe is still there), easier cutting and pasting as well as better battery management. Where Samsung drops the ball though is with their TouchWiz interface. Although the SII runs the latest incarnation (TouchWiz 4.0) we simply did not receive that much of an improved experience from it. While HTC’s new Sense UI at least organises your apps nicely, allowing for a favourites and downloaded tab, Samsung still lobs all your apps together under one menu. And why they opt to have the far left screen as your main home screen, instead of for example the third screen where you have the option to quickly move left or right to other screens, only they will know. This was the reason why we discovered the very handy LauncherPro app, since the Galaxy S did the same. While we’re not altogether the biggest fans of proprietary UI (partly the reason why the skin free Google Nexus S is so appealing), they can add to the Android experience, but unfortunately TouchWiz 4.0 does not bring much to the party. Maybe Samsung’s software engineers were kept busy developing Kies Air, Samsung’s content management system that now allows you to upload or download music, photos and videos via a browser without the phone having to be connected to your PC (only on the same router). It’s a long way off from Apple’s amazing iCloud service scheduled for release with iOS 5, but a step in the right direction nonetheless. We also enjoyed a smart little scheduling feature we noticed. We received an SMS along the line of “See you later today”. “Today” was hyperlinked and when clicking it, it opened a calendar to immediately schedule the appointment. The three million customers who placed pre-orders for the Samsung Galaxy SII certainly won’t be disappointed. It is one of the best smartphones currently available thanks to not only a wafer-thin design (8.5 mm), but also a 4.27” touch-screen that can easily be mistaken for a serving platter, all supported by one of the fastest dual-core processors in circulation. While the TouchWiz user interface might lag behind the hardware, it’s far from a reason to dismiss the SII. This phone will be a top-seller and already booked a place under 2011’s top 10 smartphones. It will retail for between R6699 and R6999 when it hits the South African shelves in July. 1.2 GHz dual-core processor, 4.27" screen, 8.5 mm body - enough said. TouchWiz 4.0 does not bring too much to the table, no mini HDMI out, speakerphone a bit soft. 1.2 GHz dual-core processor, 4.27 inch screen, 8.5 mm body - enough said.